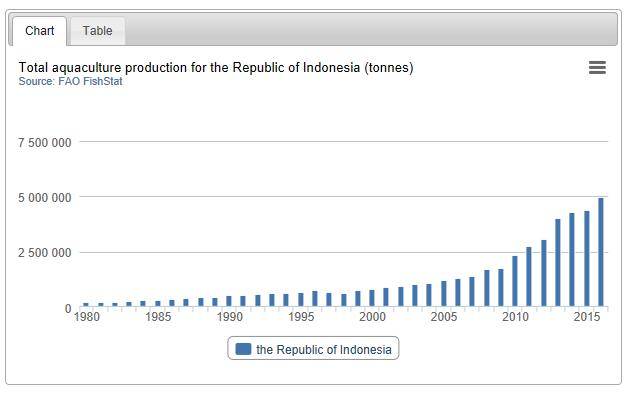 Indonesia is one of the world’s most important aquaculture producers. Indonesian smart fish-feeder startup eFishery has raised US$4 million from investors including Aqua-spark, Wavemaker Partners, 500 Startups, Social Capital, and others, it announced today. Launched in 2013, eFishery offers fish and shrimp farming businesses a way to automate feeding via smart sensors. It claims to have grown its revenue by over 261 times in the last two years, and that it is a profitable company. It is now deployed in 16 provinces and 67 cities in the country. The startup will use the funds to expand nationally, increasing its presence in farming areas, building its data platform, and boosting recruitment efforts. It currently has a headcount of 67 people, with most people in field sales and operations. The fishing industry is massive, as demand for seafood skyrockets. Asia is in a unique position to capture this potential, as it is the world’s largest supplier of “farmed shrimp” garnering 89% of the aquaculture products industry. According to a chart provided by the Food and Agriculture Organisation of the United Nations, the total aquaculture production for Indonesia has been increasing every year, making Indonesia the world’s third major fish producing country after China and India. Paul Santos, managing partner at Wavemaker Partners, said in a statement that there are a few reasons why the firm invested in eFishery. First of all, the entrepreneurs are “experienced local co-founders”, he said, adding that “they know the aquaculture farming industry and its pain points” and that “their network will be crucial in helping eFishery grow”. According to Santos, eFishery could find success even without expanding overseas, because there are 10 million fish and shrimp ponds in Indonesia alone. Secondly, the product boosts productivity while reducing costs, he said. The startup wants to further use its technology to gather data on fish and shrimp cultivation, as it believes this can be used to solve further issues in aquaculture planning and financing. efishery has been partnering financial institutions to offer financing options to aquafarmers in a pilot project, and it’s working with restaurant chains to get better deals for farmers, said eFishery CEO Gibran Huzaifah. Huzaifah told KrASIA in an email that the key challenges the firm faces lie in acquiring customers who are mostly traditional fish or shrimp farmers. To combat this, the team would often go the ‘grassroots’ route by being on the ground, building relationships and educating their clients on their technology. It generates revenue with a one-time purchasing fee, as well as a monthly subscription model for usage of its hardware. He added that the company is “currently running some pilots for new revenue models to generate revenue” from its data platform. While Indonesia might be a valuable market on its own, eFishery is not letting up on markets elsewhere. He said that the team is currently working on a pilot programme in Vietnam, Bangladesh, and Thailand. “Our goal is to create more impact in the farmer level regionally by bringing our technology in the market. In doing so, we will be having sole local partner in respective countries to help the scaling process faster,” he concluded. (UPDATE) – 13 November 2018, 3.03 PM: This article was updated to reflect additional comments from Gibran Huzaifah about what the capital will be used for, ways of generating revenue, key challenges faced, number of people in the firm, and how the company is looking at market expansion plans.